What Else Can I Expect From an Online Bachelor's in Nursing Program? What is an Online Accelerated Nursing Program? Registered nurses (or RNs for short) treat and care for sick and/or injured patients at hospitals, clinics, rehabilitation centers and other healthcare facilities. RNs are tasked with a wide assortment of day-to-day responsibilities, most of them related to diagnosing patients, collecting samples for testing, counseling, patient record keeping and appointment scheduling. According to the Bureau of Labor Statistics (BLS), there are approximately 2.95 million registered nurses working in the U.S. today ― making this one of the largest employment fields in the country. Jobs for RNs are also projected to grow by 15% between 2016 and 2026, resulting in the creation of roughly 438,000 new positions. RNs must be licensed to work in all 50 states and the District of Columbia. Although many RNs launch successful careers with an associate degree in nursing or a nursing diploma, a bachelor's degree can help qualified candidates compete in the tough job market. The most popular undergraduate route for RNs is a Bachelor of Science in Nursing, or BSN. BSN degree programs feature foundational coursework designed to equip students with the knowledge and skills needed to advance their nursing career. BSN pathways also include at least one internship or clinical residency, allowing students to receive supervised, hands-on training from experienced professionals at working healthcare facilities. Many of today's students are choosing to earn their BSN online, rather than in a classroom. Web-based students follow the same rigorous curriculum as their brick-and-mortar counterparts, leading to a comparable number of post-degree job opportunities; many BSN programs are also accelerated, enabling students to graduate in as little as one to two years. Additionally, the study-from-home online format can be ideal for students with conflicting commitments ― such as part-time jobs or childcare ― that may interfere with campus-based education. This guide will cover BSN programs designed for students with experience as licensed registered nurses. For more information on a similar educational pathway, please visit our Guide to Online RN to BSN Degree Programs. Learn more about what you can do with an RN to BSN and what kind of career opportunities you can look forward to with this comprehensive guide. CAN I GET MY BSN ONLINE? Yes. There are many online BSN programs. However, most of these programs include on-site clinicals, which can be completed in a students community. Read more here..
HOW LONG DOES IT TAKE TO GET YOUR BSN ONLINE? Most online BSN programs will take one to two years to complete with full-time study. Read more here..
HOW DO I GET INTO AN ACCELERATED BSN PROGRAM? Most accelerated BSN programs are only open to students who hold a bachelor's degree in another field. Read more here..
Nurses with a BSN have more career opportunities than RNs. They can become nurse educators or public health nurses. A BSN also prepares learners for advanced studies. Read more here..
WHAT IS AN RN-TO-BSN PROGRAM? An RN-to-BSN bridge program is designed for RNs who are seeking greater career opportunities. It builds upon the knowledge learned through an RN program. Read more here..
WILL AN ONLINE BSN PROGRAM PROVIDE ME WITH THE SKILLS I NEED TO ADVANCE MY CAREER? BSN degree programs will build on the knowledge and skills that students have gained while working as licensed RNs. The curricula include coursework in human anatomy and physiology, microbiology, pharmacology, healthcare administration and medical billing and coding. Internships and residencies give students the chance to apply what they have learned in order to solve problems and address concerns at real-world healthcare facilities. WILL AN ONLINE BSN WORK WITH MY SCHEDULE? Online BSN degree programs provide a flexible alternative to traditional higher education. Students can access course readings and lectures, participate in virtual discussions with other students and faculty, submit written assignments, take exams and communicate with their professors ― all on their own schedule, and from the comfort of home. Current technology also allows them to study away from their desktop using a laptop, tablet, smartphone and other portable devices with Wi-Fi capabilities. For added convenience, online BSN students can often coordinate onsite trainings at healthcare facilities close to their current residence. WHAT JOBS CAN I GET WITH MY BSN? The BSN degrees listed below are aimed at registered nurses who plan to advance in their RN career. Many BSN programs offered today enable students to earn degree concentrations in niche areas of nursing like critical care, pediatrics, rehabilitation or addiction nursing. A specialization can open up additional opportunities for qualified graduates. A BSN is also suitable for students who plan to continue their education with a Master of Science in Nursing (MSN) degree; a master's is often required for advanced nursing roles, such as midwives, anesthetists and nurse practitioners. WHAT ARE THE BEST ONLINE BSN PROGRAMS? Choosing a program is an incredibly personal decision, and only you can properly evaluate whether a target school's strengths match your educational needs. The following ranked list of schools should serve as a helpful starting point in your search for the best online BSN programs in the United States. Our ranking is based on the courses schools offer, available specializations, student outcomes, career support services, and other criteria used to determine academic excellence. If you are considering an online BSN program, be sure to contact admissions specialists at different colleges and universities to learn more their about specific bachelor's degree requirements and offerings. Founded by a group of U.S. governors in 1997 and headquartered in Salt Lake City, Utah, Western Governors University provides higher education programming through its affiliates and satellite campuses across the western and central United States. This regionally accredited, online-based school offers a bachelor of science in nursing degree ideal for licensure-seeking learners residing in California, Texas, Florida, Indiana, or Utah. This 120-credit program possesses programmatic accreditation from the Commission on Collegiate Nursing Education (CCNE) and covers a variety of topics necessary to obtain nursing licensure in the field, including clinical practice, pharmacology, and applied healthcare. The program delivers synchronous instruction in a hybrid format that combines online learning with hands-on modules. Learners pay a flat rate each term and can complete the program in 2.5 years. Interested applicants must satisfy certain general education prerequisites and must hold a minimum 2.5 GPA as well as a passing score on the ATI TEAS exam. This program prepares learners for a variety of state-level licensure processes in the field and relevant examinations such as the NCLEX-RN exam. Degree seekers take part in a vigorous course of study and an enriching clinical placement experience that allow for exploration within the field while also providing a quality foundational education. Individuals in this BSN online program acquire the knowledge and core skills to land gainful employment in a range of industries that require nursing and healthcare professionals. Established in 1895 and nestled in the heart of the Dallas-Fort Worth metropolitan area, the University of Texas-Arlington stands as a major public research university, offering degree seekers a plethora of online and accelerated academic programs. UTA's bachelor of science in nursing online boasts one of the state's highest graduation and licensure rates, exceeding an impressive 90% annually. This affordable, 120-credit BSN online program offers learners a hybrid experience, delivering course content in a digital space while placing late-stage degree seekers in supervised clinical sites located in a major Texas city, including Dallas-Fort Worth, Houston, or San Antonio. Interested learners must meet general education requirements with a minimum cumulative 2.75 GPA. Individuals must also complete the TEAS exam prior to application. Once enrolled, degree seekers experience a swift but demanding course of study that covers material necessary for the NCLEX exam and further career advancement. Some course topics include pathophysiologic processes, holistic health, and clinical foundations. Most learners graduate in as few as 15 months, finding themselves on the precipice of licensure and fully prepared to enter a growing, competitive workforce. UTA's BSN online program offers services to degree seekers across the entire contiguous United States (except Tennessee and Washington) at a flat tuition rate of $350 per credit. UTA and its nursing courses of study hold regional and programmatic accreditation from the Southern Association of Colleges and Schools and CCNE, respectively. Located in Sawdust City, the University of Wisconsin-Oshkosh is the third largest higher education institution in the Badger State, providing academic programming to more than 25,000 degree seekers each year. UW-Oshkosh offers an accelerated online bachelor's to BSN program ideal for learners residing in select states across the U.S. This 12-month, 50-credit course of study ranks highly among online accelerated BSN programs due to its rigorous academics and its success in graduate placement. With an attrition rate of less than 1% and a NCLEX first-attempt pass rate that consistently exceeds the national average, UW-Oshkosh's BSN online program places degree seekers in an excellent position to advance their careers. Eligible applicants must hold a bachelor's degree from a fully accredited university with a minimum 3.0 GPA and meet the UW-Oshkosh course prerequisites. Learners must also provide proof of residence in their home state, submit evidence of current nursing assistant certification with attendant experience, and agree to a criminal background check. Following admission, degree seekers begin an intensive and robust experience that combines online coursework with clinical rotations in learners' home communities. Students explore topics such as health assessment theory, pharmacology, and mental health theory, all of which prepare them for a variety of careers and professional placements within the industry. UW-Oshkosh and its accelerated BSN online hold full accreditation from the Higher Learning Commission and CCNE. Located in Fargo, North Dakota State University is one of the state's largest universities and a major component of the Red River valley research corridor. This intellectual hub centers on science, technology, engineering, and professional disciplines in the healthcare industry. NDSU offers an appealing LPN-to-BSN online degree to interested learners and working professionals. This blended program uses synchronous instruction and caters to LPNs with an associate degree in nursing. Like other online BSN programs, this program offers students all the resources necessary to obtain RN licensure and further advance their careers in the field. This program requires learners to complete in-person validation exams and carry at least 60 hours of transferable, general education credits from an accredited institution prior to admission. Applicants must maintain a minimum 3.0 cumulative GPA, both in credits transferred and in their work at NDSU. Most degree seekers finish their course of study in two years or less, acquiring knowledge in topics such as integrated and psychosocial nursing while completing synthetic, practical components. The standard tuition rate for NDSU's LPN-to-BSN online program is $545 per credit. Enrolled learners can expect to gain the core skills and knowledge necessary to obtain RN licensure and increase both their professional aptitudes and their overall earning potential in the field. NDSU holds regional accreditation from the Higher Learning Commission. The school's LPN-to-BSN program possesses programmatic accreditation from CCNE. Founded in 1881, Concordia University-Wisconsin is one of nine regionally accredited colleges and universities comprising the Concordia University System, a higher education organization operated by the Lutheran Church-Missouri Synod. Located in Mequon, a municipality of the greater Milwaukee metropolitan area, CUW boasts a BSN online program specifically designed with working professionals in mind. Thanks to CUW's accelerated, online, and hybrid programming, learners can streamline their BSN experience in as few as 18 months at an affordable tuition rate of approximately $500 per credit. Degree seekers interested in CUW's program must hold a current RN license and an associate degree in nursing from an accredited school with a minimum cumulative 3.0 GPA. Enrolled learners acquire a broad knowledge base and transferable skills throughout the 63-credit course of study, with a special emphasis on population health, nursing research, and healthcare informatics. Many degree seekers tailor this curriculum to fit the needs of their social and professional lives, taking one class at a time, several at once, or blending online learning with instruction on one of CUW's 10 conveniently located learning centers in the Midwest. Learners can also opt to move through the program with a cohort of colleagues. Cohorts work together in theory courses, corresponding labs, and stimulating clinical practicum experiences, all of which contribute to an enriching overall experience centered around peer support and professional development. CUW's nursing program holds programmatic accreditation from CCNE. The BSN prepares learners for successful, fulfilling careers in the nursing industry and other related fields. Positioned in Indianapolis, Indiana, the Midwest's third largest city, Marian University is a private, nonprofit, Roman Catholic-affiliated institution first founded by the Sisters of St. Francis in 1851. This regionally accredited university provides professional and liberal arts-oriented programming to prepare and cultivate transformative leaders. Through its online BSN program, Marian's Leighton School of Nursing offers degree seekers an attractive, expedited path to career advancement. This degree stands out among online accelerated BSN programs because of its special emphasis on hybrid learning that combines synchronous online coursework with onsite labs and in-person clinical rotations in Indianapolis or Nashville, Tennessee. Marian's BSN online program provides learners with a highly individualized, well-rounded educational experience that most can complete in less than 18 months at a tuition rate of $825 per credit. This accelerated program focuses on second-degree nursing instruction. The university's online, accelerated BSN program holds programmatic accreditation from CCNE. The school's graduates enjoy an NCLEX pass rate of more than 90%, placing them in an excellent position to obtain licensure and enter the growing workforce. Applicants must hold a non-nursing bachelor's degree from a regionally accredited institution with a minimum cumulative 2.8 GPA. Learners must also complete a series of pre-nursing coursework prerequisites prior to admission. Once enrolled, learners begin an accommodating but intensive course of study that lays the foundation for professional development and rigorously prepares degree seekers for nursing licensure. A public, regionally accredited state university located in Pinellas County, Florida, St. Petersburg College confers associate and bachelor's degrees in a variety of disciplines, including healthcare and nursing. St. Petersburg's BSN online program provides a convenient path to graduation for licensed RNs interested in obtaining a bachelor's degree. This 40-credit program, which most learners complete in two years or less, focuses on evidence-based practice, leadership and management, health promotion, ethical issues, and community risk reduction. The school possesses programmatic accreditation from CCNE and offers courses in discrete, eight-week modules. Upon admission, degree seekers begin a vigorous course of study oriented around practical application in clinical settings and overall professional development. Courses cover pathophysiology, health assessment, informatics and clinical reasoning, and multicultural nursing theory. A practicum component of 45 documented hours gives degree seekers the opportunity to develop their own individualized learning contract specific to their community or organization. Working professionals enrolled in St. Petersburg College's accelerated online BSN program benefit from asynchronous instruction. Students can conveniently take one course at a time or several at once depending on outside factors such as work and family. Interested applicants must hold a relevant degree from a regionally accredited institution with a minimum cumulative 2.0 GPA as well as an active, unrestricted RN license. Learners must maintain their active licensure throughout the program's duration. Initially established in 1946 by Syracuse University as an extension campus, Utica College, now an independent, private four-year institution located in New York's Mohawk Valley, provides programming across a broad swath of healthcare-related disciplines. 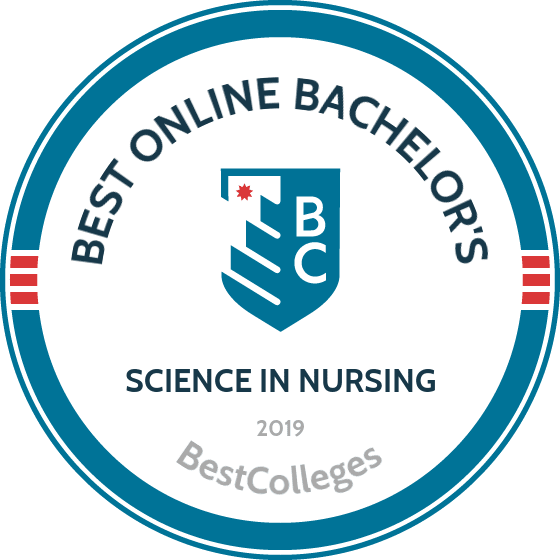 Like other online accelerated BSN programs,UC's accelerated bachelor of science in nursing benefits degree seekers interested in completing their course of study quickly and efficiently. This hybrid program combines convenient online coursework with robust nursing simulation labs and clinical rotations in local hospitals. These components provide learners with the levels of theoretical knowledge and practical application they need to pass the NCLEX exam, obtain field licensure, and further advance their careers. Graduates from UC's online nursing program benefit from an impressive 91% first-time passing rate on this exam. Learners complete this 62-credit BSN online program in as few as 16 months on average, paying a variable tuition rate of about $800 per credit. Interested applicants must hold either 65 credits that meet the stipulated general education prerequisites or a non-nursing degree (associate or bachelor's) from a regionally accredited institution that satisfies those same requirements. Following admission, degree seekers cover a variety of subjects necessary to earn licensure and acquire gainful employment in the industry. Topics include physiological integrity, safe and effective care environments, psychosocial integrity, and health maintenance. UC holds regional accreditation from the Middle States Commission on Higher Education. The school's online accelerated BSN program carries programmatic accreditation from CCNE. Founded nearly 125 years ago, Indiana State University offers more than 175 undergraduate majors and professional degrees. The school is located in Terre Haute, just along the Hoosier State's westernmost border. ISU's LPN-BSN track allows interested LPNs and LVNs to complete a BSN online degree and achieve RN licensure. This 120-credit program provides degree seekers with an enriching 2-3 year course of study at an affordable rate for Indianans and students from nearly every other state. ISU maintains full regional accreditation. The BSN online degree possesses programmatic accreditation from CCNE. Unlike most other online BSN programs, ISU's program requires applicants to already hold an active LPN/LVN license in their state of residence. Interested learners must retain a minimum 2.75 GPA throughout the program. Applicants must also complete the Kaplan Admissions Test (KAT) prior to admission. The KAT, a standardized pre-admissions assessment, costs $50 and serves as a predictor of learners' potential for success in the program. Once enrolled, full-time degree seekers and part-time learners embark on a stimulating journey that covers subjects such as pathophysiology, health biostatistics, and nursing leadership. Students must all undergo a special licensure preparation class. This course equips learners at all levels to successfully sit for the NCLEX examination and obtain full licensure in the field. Online learning modules at ISU pair with local clinical experiences based in degree seekers' home communities. This BSN online program brings theory and practice together as learners acquire the skills and knowledge necessary to advance their careers in the field. Chartered in 1908 and located along the southern corridor of the west Texas panhandle, Wayland Baptist University is a private university affiliated with the Baptist denomination. The online bachelor of science in nursing degree shines among WBU's 65 programs of study. This 43-credit, two-year BSN online offers a quick but comprehensive path to degree completion at an affordable tuition rate of about $400 per credit regardless of a learner's state of residence. WBU's BSN online program combines small, individualized courses with direct clinical studies performed in state-of-the-art facilities, providing degree seekers with an enriching level of knowledge and practical application. Some of these courses include developmental psychology, fundamentals of human anatomy and physiology, nutrition, and nursing theories and research. These courses follow a synchronous schedule. The hybrid program format requires learners to travel to WBU for three different week-long skill labs. These labs supplement and enhance standard coursework, allowing degree seekers to hone and practice a core set of skills necessary to thrive in a highly competitive work environment. Interested learners must complete an online application, submit relevant test scores, and provide official copies of their transcripts. WBU holds regional accreditation from the Southern Association of Colleges and Schools. The institution's BSN online program also possesses programmatic accreditation from the Accreditation Commission for Education in Nursing. Online nursing degree programs prepare students to work as nurses in hospitals, long-term care facilities, private homes, and more. It's becoming more common for licensed nurses to require advanced degrees to move up in their careers. All nursing programs include courses that require clinical hours so that students get hands-on experience. Students searching for online nursing schools should keep in mind that requirements vary depending on the school and program chosen. Courses offered in online nursing degree programs vary from school to school. Some programs focus more on the technical skills needed to become a practicing nurse, while others give a broad overview of the nursing field. All nursing students are required to complete clinical hours for hands-on experience. Below you'll find a sample curriculum for a BSN online. Health assessment: In this course students learn how to assess the health of patients. Topics covered include gathering a health history through a patient interview and assessment techniques, including palpation, inspection, and percussion. Students will learn the difference between normal and abnormal conditions. Evidence-based nursing and research: This course provides an introduction to evidence-based nursing practices and helps students understand research and how to use it to provide the best nursing care. Students learn critical thinking skills and how to improve patient care through evidence-based practices. These skills are necessary for effective practicing clinical nurses and nurses who go into research positions. Leadership in nursing: This course is essential for any nursing student who is interested in pursuing supervisory positions in the healthcare field. Leadership skills that help improve patient outcomes are covered, including quality improvement, safety, communication, ethical decision-making, and organizational culture. HOW LONG DOES IT TAKE TO GET AN ONLINE BACHELOR'S IN NURSING? How long it takes to complete online nursing programs is determined by many factors. One factor affecting program length is the number of courses available each term and whether the student attends part-time or full-time. Some programs give students the choice to go at their own pace, while others adopt a cohort learning approach. In cohort programs, a group of students go through the program together, taking the same courses each term. The cohort approach fosters a community of learners who support each other. Students who go at their own pace have more flexibility with how many courses they take and when. On average, it takes three years to complete an online nursing degree. Students who already hold an RN license may be able to complete their bachelor's quicker, often in just two years. Students who already hold a bachelor's in another subject may be able to enroll in an accelerated nursing program, completing studies within 11 to 15 months. An online accelerated nursing program lets students who already hold a bachelor's degree in another subject to quickly earn their bachelor's in nursing. Accelerated programs allow students to complete their degree in less time than would be required by a regular nursing program. Students usually finish in 11 to 15 months. Accelerated BSN programs generally cost less to complete since students have fewer courses to take. Before selecting an accelerated BSN online program, students should consider if they will be able to make the time commitment: most accelerated programs require students to attend full-time and discourage or prohibit working while completing the degree. When looking for a school to attend to pursue a bachelor's in nursing online, it's important to make sure the school and program are accredited. Accreditation is a voluntary process in which schools and their academic programs are evaluated to make sure they meet minimum educational standards. There are two types of accreditation: regional and national. Regional accreditation agencies concentrate on specific geographic regions of the country. National accreditation agencies can accredit schools in any part of the country. By choosing accredited, online nursing schools, students can be assured they will get a quality education. It's important for nursing students to make sure the online program they choose has an industry-specific accreditation. Nursing programs in the United States are accredited by the Commission on Collegiate Nursing Education and the Accreditation Commission for Education in Nursing. Two organizations play important roles in accreditation: the Department of Education and the Council for Higher Education Accreditation. The Department of Education (DOE) is a U.S. government agency that establishes policy and coordinates federal assistance, including student loans and grants. The DOE publishes a list of nationally recognized accreditors. The Council for Higher Education Accreditation is an organization of degree-granting American colleges and universities. Its purpose is to coordinate the accreditation process for higher education in the United States by ensuring the quality of accrediting agencies. For a list of all accredited schools, visit the Department of Education or the Council for Higher Education Accreditation. In recent years, the demand for qualified RNs has been fueled by a rising number of patients who need medical care. Millions of previously uninsured Americans currently receive medical coverage under the Obama Administration's Affordable Care Act (ACA), and an aging baby boomer population has increased the need for nurses who specialize in caring for elderly patients. As a result, jobs for nurses are plentiful and unemployment rates are relatively quite low. How to registered nurses stack up against other nursing personnel in terms of their job outlook? The table below lists unemployment rates of RNs and four other nursing occupations. All five entries were featured in the 'Best Healthcare Jobs' of 2017 ranking from U.S. News & World Report. While the unemployment rate for RNs is more than twice as high as the rates for the other four occupations, this figure is much lower than the national unemployment rate for all professions, which currently sits at 3.7%. A BSN leads to higher salaries than an associate degree or nursing diploma, according to the latest data from PayScale. The table below looks at the differences in career earnings for bachelor's-, associate- and nursing diploma-holders. Of the three entries listed above, nursing diploma recipients reported the highest rate of career salary growth: an increase of 70.7% between after 20 years in the workforce. BSN-holders reported 27.5% career salary growth, while those with an associate degree reported 29.1% career salary growth. However, it's important to note that specific job titles will also impact earning potential for BSN recipients. The next table explores the 20-year salary growth of RNs and four other occupations related to nursing; all five careers are attainable with a BSN degree. Although RNs reported the lowest salaries at all five career benchmarks, they also enjoyed the highest career earnings growth: a 29.1% rise after 20 years. Nursing directors placed second among the occupations listed with 17.5% career earnings growth, followed by nurse case managers with 17.1% growth. Students who complete a BSN program and graduate with a degree will be qualified to compete for hundreds of nursing jobs, including some managerial roles that require some college education. The RN and APRN professions are outlined below. Addiction nurses support patients who are receiving treatment or rehabilitative services for alcoholism, drug abuse and other types of addiction or substance dependency. Cardiovascular nurses care for patients who are hospitalized with different heart diseases, conditions and/or injuries. They also support those who are undergoing or recovering from heart surgery and other operative procedures. Critical care nurses provide constant care and support for patients who are severely injured, seriously ill or otherwise require constant supervision and evaluation. Genetics nurses support patients with hemophilia, cystic fibrosis, some forms of dementia and other conditions that are genetically inherited. Neonatal nurses care for newborn babies, as well as mothers who have recently given birth and their partners. Nephrology nurses care for and support patients with diseases, conditions and injuries related to their kidneys and urinary system. Rehabilitation nurses specialize in services for patients with permanent disabilities that impact their daily lives. In order to become licensed as an RN in all 50 states and the District of Columbia, candidates must receive a passing score on the National Council Licensure Examination (NCLEX-RN). Additional licensing requirements will vary by state; most include a certain number of post-degree training hours. Licensed RNs must also commit to continuing education courses every year. Advanced practice registered nurses (APRNs) are licensed RNs who have received additional training in an advanced nursing field. Most APRNs have earned an MSN, as well. The three most common job titles for APRNs are listed below. Nurse anesthetists (also known as CRNAs) provide anesthesia to patients who are undergoing surgeries, operations and other procedures that require them to be put under. They also assist with pre- and post-operative care, since many patients struggle with the short-term effects of anesthesia. Nurse midwives (also known as CNMs) care for women who are pregnant or in the process of delivering a child. They often perform gynecological exams leading up to (prenatal) and after childbirth (post-natal), as well. Nurse practitioners (also known as NPs) specialize for patients with round-the-clock care needs stemming from critical, severe or acute injuries, illnesses and other conditions. NPs may also meet with patients and their families to discuss the various impacts of medical diagnosis and treatment. Making professional connections and learning about different approaches to nursing is crucial to your success. Professional organizations offer a great entry point for students who want to learn more about their chosen career path. Below you'll find three of the country's most prominent organizations established for registered nurses. These organizations host networking events, provide online trainings, maintain active job boards, and offer other services for career-ready college graduates. Emergency Nurses Association: Established in 1968, the ENA was created to represent nurses who serve patients in emergency rooms, critical care units and other highly demanding settings. The organization today advocates for patient safety, as well as optimal emergency nursing practices.